In this business we call show the big reveal is usually kept until the end, but I say to hell with that. A blogger who is familiar to regular readers, Lallands Peat Worrier came out of the shadows this week and appeared on the BBCâ€™s Politics Show Scotland. Caronâ€™s Musings has the video. How interesting to see someone you only imagine and find out how wrong you were. Among her own highly recommended posts, Caron is also casting the spotlight on a campaign by BurdzEyeView to buy books for vulnerable kids. Itâ€™s shocking that in Scotland there are children who donâ€™t have access to books â€“ letâ€™s do something about it. Sticking with childrenâ€™s books. Hestiaâ€™s Larder visits an exhibition of illustrations for childrenâ€™s books that looks at the work of Julia Donaldson and Axel Scheffler of Gruffalo fame. Meanwhile, on equally tasty matters, a new shop opened this week in Glasgow causing much excitement in some circles. Julie Scrumptious talks about the new Wholefoods Market in Giffnock. She considers whether this temple for foodies can survive in an economic downturn. Also seeming to buck the financial downturn in the retail market, H & M launched their Versace range. Transatlantic Blonde was there and used the post as part of her What I Wore Wednesday series. Given that Iâ€™m not particularly interested in what I wear on any given day of the week, why do I find this so fascinating? Itâ€™s that thing about bloggers getting out from behind the keyboard and showing their faces. Joining in Transatlantic Blondeâ€™s theme was Glasgow Mummy. Getting away from the glitz, BigRab has an entertaining collection (Iâ€™m struggling for a suitable collective noun) of toilet humour. Blogger Iain Hepburn now has a regular slot at The Drum. This week he looks at the role of key bloggers in the news. With less than a month to go, you may as well give up attempts to ignore Christmas coming at us like a juggernaut. Rookie Oven announces a festive special for startup entrepreneurs. Aye Tunes is after the quintessential Christmas song and Subrosa reckons she knows whoâ€™s going to be number one. Yes, I agree this roundup is definitely more froth than dark, bitter coffee. No apologies though, itâ€™s down to the editor of the day â€“ and today itâ€™s me. If you want more gravitas and some proper political hard-hitters slugging it out, then step forward to take a turn at editing and make the roundup your own. 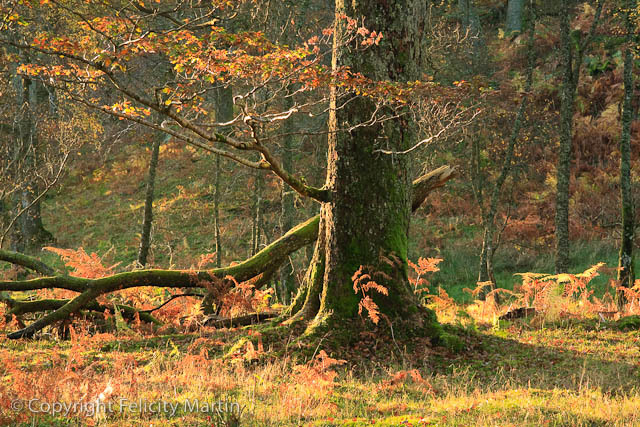 The picture comes from Felicity Martinâ€™s Walking Wild blog. Great to see photos attached to posts Ellen. Well done. That’s a lovely photo of the autumn leaves, the red and gold colours really give out a warm glow, despite the fact we’re heading for a cold winter. Subrosa, just one picture makes such a difference, doesn’t it?